Development in Action | Egypt: a second revolution? The events in Egypt of the past six days have not failed to shock the western world and have prolonged our fascination with the Arab Spring. As the country goes ahead with its election next week in the wake of national protests met with military violence, Sophie Nodzenski considers whether the recent uprisings signify a second revolution for Egypt – or merely a continuation of the first. “The people want the fall of the Marshall”; “One: civilian power, Two: a national government” are catchphrases that resonated in the streets of Cairo after the Field Marshall Mohamed Hussein Tantawi, head of the ruling military council, pronounced his speech on television on Tuesday November 22. Hundreds of thousands of angry demonstrators rejected his promise to speed up the transition to civilian rule and demand the SCAF (Supreme Council of the Armed Forces)’s immediate departure. The current uprising is the result of a contained anger against the SCAF that has been in charge of the ‘management of the transitional process’ since the overthrow of Hosni Mubarak last February. Over the past few months, Egyptians have staged enormous demonstrations to press their demands with regards to the implementation of a democratic system, from insisting on dismissing the government that Mubarak had appointed before he was ousted to setting a clear and specific timetable for the establishment of the transition. The SCAF has been extremely reluctant to respond to these demands, ignoring the transition process of power to a civilian authority and the implementation of an effective democratic system, which was the main goal of the revolution of 25 January. The climax of the Military Council’s ‘policy of denial’ was reached when it decided to secure its position in the transitional process by drafting several super-constitutional principles that, if they were to be agreed upon by the major political forces, would grant the military council a special status in the new political process. The SCAF would become sovereign above all other institutions, including the parliament that is supposed to be elected on 28 November. It would grant the military veto powers over the laws and strip the elected parliament of some of its authority. The recent uprising that started on 18 November is a direct reaction to the latter. With violent protests in the streets and a clear demand to dismiss the current transitional military council, can we speak of a ‘second revolution’ inEgypt? The similarities between the current protests and those leading to Mubarak’s overthrow are striking. 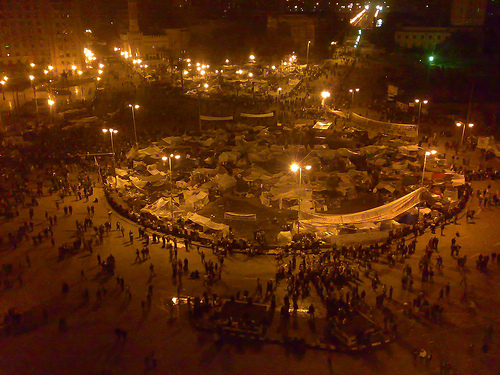 There is a clear pattern of three successive steps occuring in the same way: protesters start by gathering on Tahrir square and demand the implementation of a democratic system; secondly, after the violent use of armed force against the protesters, the head of the government gives an unsatisfying speech and does not respond to the people’s demand. Thirdly, the people’s request for democracy ends in a claim for abolishing the rules of the government in power: Mubarak in February, the SCAF represented by Tantawi in November. The officials currently holding the power are clearly remnants of Mubarak’s regime. The SCAF is made up of generals appointed by Mubarak – Tantawi was his last defence Minister – who claimed power for themselves last February. Claiming to be ‘supporting’ the people, the Council has been trying to consolidate its illegitimate power since then. Thus, the Egyptian people are not organizing a second revolution, as they are trying to defend the same objective of last winter: riddingEgyptof the former illegitimate regime and implementing a democratic system. According to many protesters, whatEgyptis witnessing is “phase two” of the January revolution. In a word, it is a different fight, but definately the same battle. The Military Council represented by Tantawi has to understand that killing unarmed protesters only inflames resistance and negates whatever legitimacy it is intending to claim. It has to respond to the People’s demand by letting the power go and giving way to democracy. Much could change in the days ahead. Insightful.. only time will tell if democracy prevails! How can you know where one revolution ends and one begins?